It’s about 5:30 in the evening and we’ve just finished eating our dinner. It’s now time for us – the camera guy, guide and I – to roll out. 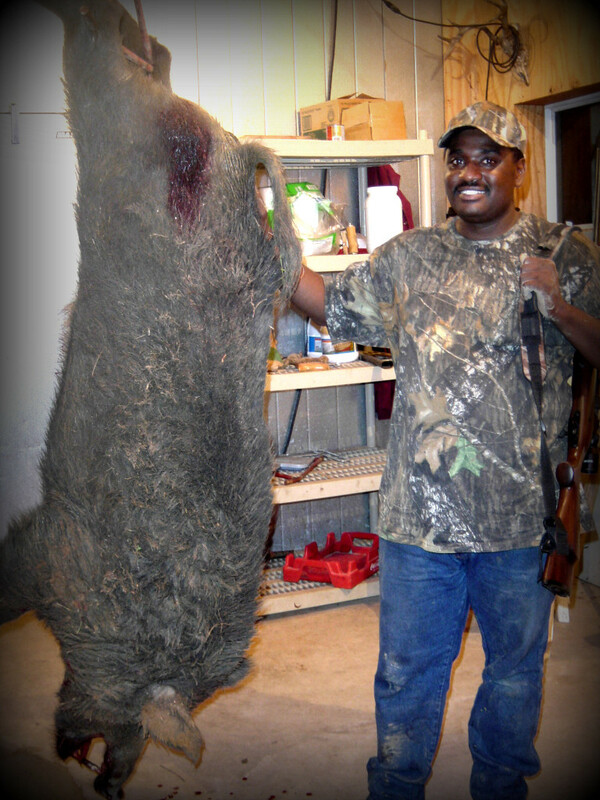 All morning we had been hunting on this private hunting preserve for this Black Russian Boar with no luck at all. I knew if we didn’t get the boar in the early morning, before dawn, we would have to come out again this evening. Boar hunting is typically done at night, because that’s when Boars normally roam around. Every now and then you can get lucky with an early morning hunt, but today wasn’t one of those days. So, after dinner, we got in our jeep and drove about three miles out to the site were we had been hunting earlier. This is a place where Boars were seen on several occasions wallowing in the mud nearby. Now that we’re back, there is nothing to do but wait for the sun to go down and the night to roll-in. It’s has been a couple of hours and were just sitting quietly waiting for this wild animal; I just hope he decides to visit his favorite spot tonight. I’ve been waiting to go wild boar hunting for sometime now when I received a call from a preserve owner about the wild boars on his land. He said they were tearing up the ground all over the preserve, and attacking the other animals. A wild boar can be quite dangerous and will charge and attack a person if the opportunity arises. All of a sudden, I see him; he is about 120 yards out, running as fast as he can. I have been waiting for this moment all day, so I took my shots. Despite the fact that I know I hit him, he kept running. This is where hunting gets a little difficult, because you have to track the animal to see if he’s down. You don’t want a mad wounded wild animal – in this case the boar – running around. That’s not a good thing. Whatever you take down you need to find it, so we start tracking. Fortunately, there was a bright full moon to provide all the light we needed. This helped a lot as we followed the path I believe the boar ran. Instinct coupled with experience kicks in, and I am on him, and in a matter of minutes I spot my boar lying over by some brush. We cautiously walk over to him, but as we approach we can see that the hunt is over. I can tell you this one thing though; you wouldn’t want this animal coming after you in the dark under a full moon. He weighed about 600lbs, had two inch upper and lower tusk, and was cold black in color. To me, he looked a lot like the werewolf in the movie “Wolfen”. This Boar was definitely nothing to play with. Catch the Halloween episode of Urban American Outdoors and you too can experience the excitement of wild Boar hunting. Our new season is coming up soon. But, in the meantime, we’re headed home; everybody’s tired and happy, and most importantly, we had a safe successful hunt. Now we are planning on having a huge barbeque.